Michael Sgarbossa is usually not a fan of being woken up at 4 a.m., but on Jan. 29 he did not mind. He got a surprise wake-up call and was told that he would be joining the Colorado Avalanche on their road trip in Vancouver. 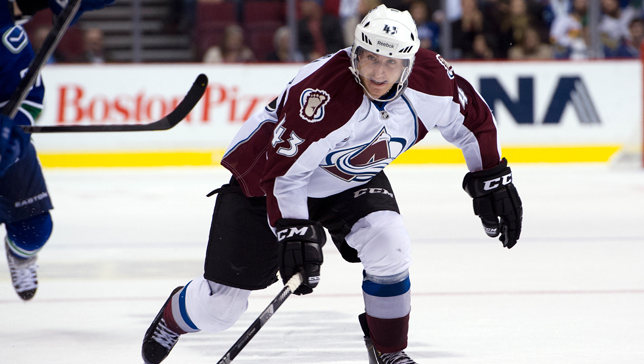 Sgarbossa was recalled to the Avalanche on that Tuesday from the club’s AHL affiliate – the Lake Erie Monsters – where he was the team’s leading scorer. He already had some previous experience with the players on the Avalanche as he participated in the team’s training camp earlier in January. However, he had never put on the burgundy and blue uniform in a game before. Sgarbossa debuted for the Avalanche on Jan. 30 in Vancouver against the Canucks and logged over 13 minutes of ice-time in 17 shifts. “It was a real honor to put on the sweater and make my family proud,” he said. “It was an exciting time”. Once he was on the ice for his first shift, the butterflies in his stomach vanished as he got involved in the action. Sgarbossa was originally signed by the San Jose Sharks as a free agent prior to the 2010-11 campaign but was acquired at last season’s trade deadline in a deal that also brought Jamie McGinn and fellow prospect Mike Connolly to the Avalanche organization. The call-up to Colorado was well justified as the 20-year old rookie from Campbellville, Ontario was having an impressive year with Lake Erie before his assignment. Sgarbossa skating for the puck in his first NHL game at Vancouver. Sgarbossa was averaging almost a point per game (0.94) by tallying 36 points (16 goals and 20 assists) in 38 games. He was tied for second in points among all rookies in the AHL and was leading his team in points and was tied for the most goals and power play goals (6) on Lake Erie. He earned eight points (three goals and five assists) in his last four games for the Monsters and helped the team win three of those contests before getting the late-night phone call. In a thrilling overtime victory against the Toronto Marlies on Jan. 24, Sgarbossa scored the game-winning goal to cap off a three-point night (two goals and an assist). It was his ninth multi-point game of the season. Sgarbossa was recognized by the league for his exceptional play and was selected to his first AHL All-Star Classic game in Providence, R.I., on Jan. 28 along with teammate Andrew Agozzino. Despite not picking up any points in the all-star game, he did finish with a plus-2 rating and helped the West defeat the East, 7-6. After playing with the Avs for a few games, Sgarbossa has noticed a major difference between the elite play of the NHL and the skill level in the AHL. While getting the early morning wake-up call wasn’t ideal, traveling all day to play with the Avalanche sure was. “It was a long day but it was worth it,” stated Sgarbossa.